The natural mummy that was found in the ice in 1991 and called Otzi has uncovered a few peculiar facts about life all over the European continent dating around 5 300 years ago. The weight of the mummy found in the ice of the Otztal Alps was more than 100 lbs., while his height was over 5 ft. According to the latest researches, he had died at the age of 45. The most impressive fact about his death was that the mummification process was not man-triggered (like the one ancient Egyptians used to do), but completely natural. The mummy was found in the area of Otztal Alps by two hikers. On a sunny day Helmut and Erika Simon, from Nuremberg, were having a promenade in the Alps. The couple was simply walking past a rocky gully and noticed something that was of a brown color. They considered it some kind of rubbish, but when they took a closer look at it, they were terrified to find a real human corpse. An examination of the mummy provided the scientists with an opportunity to make stunning discoveries. First of all, Otzi was born on the territory of Italy and then, moved more than 30 miles north. As revealed by the experts, he lived in a small village. A new DNA study performed recently has revealed a few living descendants of the iceman. To add more, gene researchers have also uncovered 19 genetic relatives of the mummy in Tyrol area in Austria. The iceman lived in a time, when copper crafting had become something completely new. For that the society was divided between the individuals, who could afford copper and the ones, who couldn’t. The mummy had a copper ax, which means his social status was pretty high. However, being relatively wealthy Otzi wasn’t protected from pain or ailment. The examination of the mummy’s stomach revealed some parasites. Besides, he had gallstones, worn joints, Lyme disease and hardened arteries. Otzi had been sick for at least a fortnight before his demise. And finally he was lactose intolerant. The very first thing that experts were concerned about was the intact condition of the mummy. Why was the grim discovery in such a perfect state? Mainly thanks to a superb chain of coincidences. 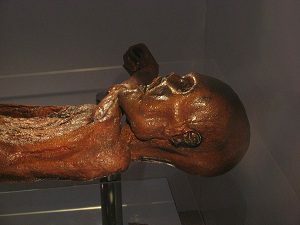 Otzi must have been covered by snow and ice right after his death. That’s the only way his body could have been solidly protected from the process of decomposition and predators. It is impossible to certainly determine whether the mummy had ever resurfaced once again during several thousand years. As shown by the Paeleoclimatic data, warm phases appeared in the course of the 2nd half of the 3rd century BC, as well as in the Roman period. That’s the time, when the ice in the gully mentioned above may have melted. The mummy was exposed to damaging sun rays, weather quirks and wind for a short period of time in 1991 between the moment of the finding was revealed and the time it was recovered. Hall, Stephen S. “The Last Hours of the Iceman.” National Geographic July 2007: 69‐81. Print. Holden, Constance. “Iceman Fights Back.” Science 301.5636 (2003): 1043‐1043. Academic Search Premier. Web. 10 March 2010. Roggla, Georg. “Tyrolean Ice Man to be defrosted for study.” Lancet 356.9231 (2000): 47. Academic Search Premier. Web. 22 Mar. 2010. Kutschera, Accelerator mass spectrometry: analyzing our world atom by atom, American Institute of Physics (AIP) Conf. Ser. 495 (1999) 407-428. Arnold and W.F. Libby, Age determinations by radiocarbon content: checks with samples of known age, Science 110 (1949) 678-680.12. M. Stuiver, P.J. Reimer, E. Bard, J.W. Beck, G.S. Burr, K.A. Hughen, B. Kromer, G. MacCormac, J.van der Plicht, and M. Spurk, INTCAL98 radiocarbon age calibration, 24,000-0 cal BP, Radiocarbon, 40/3 (1998) 1041-1083.